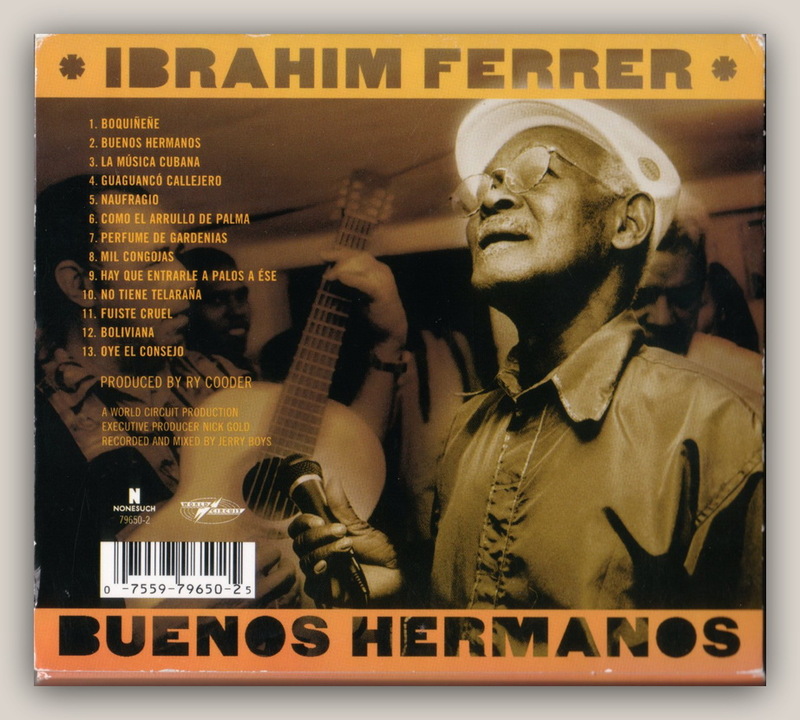 BUENOS HERMANOS won the 2004 Grammy Award for Traditional Tropical Latin Album. Ferrer’s skill as a balladeer comes through readily as he caresses each word in the lush bolero «Mil Congojas,» buoyed by the guitars of Cooder and Los Zafiros member Manuel Galban. Equally impressive are guest appearances by Flaco Jimenez, whose squeezebox is the perfect complement to Ferrer’s croon, and the Blind Boys of Alabama, whose uplifting harmonies on «Perfume de Gardenias» transcend any language barriers. Even «Oye El Consejo,» a metaphorical song dealing with Cuban society’s complex attitude towards race, provides a chance to shake your hips while making you think. 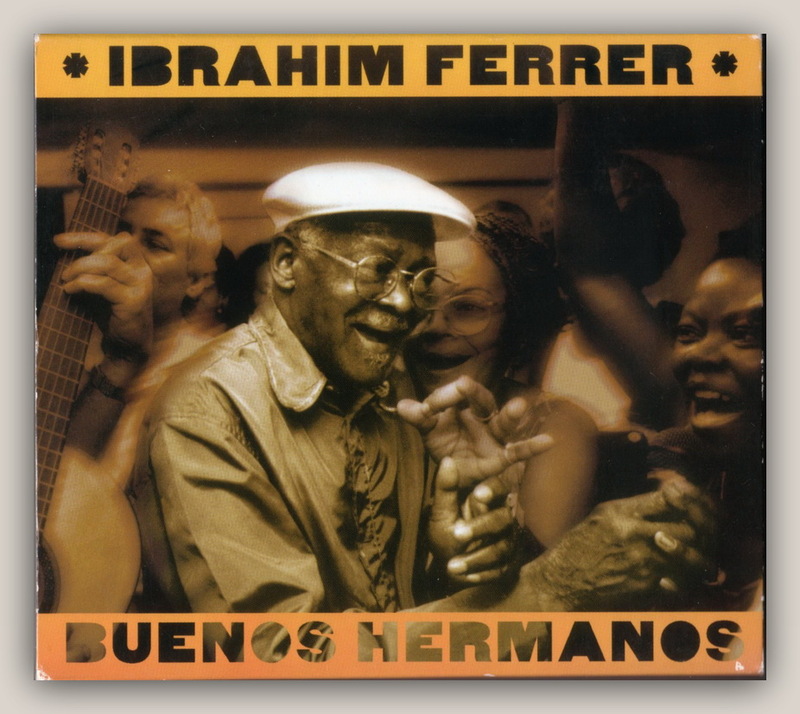 Ferrer’s first release since 1999s gold-certified debut Buena Vista Social Club Presents. Ibrahim Ferrer is full of surprises. The band includes Blind Boys of Alabama and Jon Hassell on trumpet. 13 tracks with Slipcase. Nonesuch. 2003. Recorded at Egrem Studios, Havana, Cuba. Personnel: Ibrahim Ferrer (vocals); Clarence Fountain, Joe Williams (vocals); Manuel Galbán (acoustic guitar, electric guitar, piano, organ); Ry Cooder (acoustic guitar, electric guitar); Mario Fernandez, Gerardo García, Silvio Duquesne, Ariel Sarduy, Ana Julia Badia, Rogelio Martinez, Jr., Hugo Cruz (violin); Robert Herrera, José G. Marón, Marta Amelia Salgado, Ricardo Fernandez, Enrique Navarro (viola); Alejandro Rodriguez , Arelis Zaldivar, Roy Avila (cello); Flaco Jiménez (accordion); Pantaleón Sánchez, Modero Mekanisi, Javier Zalba (alto saxophone); Rafael ‘Jimmy’ Jenks, Antonio Jimenez, Gil Bernal, Alfred Thompson (tenor saxophone); Ventura Gutierrez (baritone saxophone); Luis Alemañy, Jon Hassell , Manuel «El Guajiro» Mirabal, Alejandro Pichardo (trumpet); Chucho Valdés, Roberto Fonseca (piano); Jim Keltner, Joachim Cooder (drums); Miguel «Angá» Diaz (congas, bongos, claves); Demetrio Muniz, Bernardo Choven Garcia (congas); Isél Martínez (bongos); Amadito Valdés (timbales). Recording information: EGREM Studios, Havana, Cuba; Sound City Studios, Los Angeles, CA; Sunset Studios. Personnel includes: Ibrahim Ferrer (vocals); Manuel Galban (electric guitar, organ); Ry Cooder (electric guitar); Lemay Olano, Rogelio Martinez (violin); Roberto Herrera (viola); Arley Zaldivar (cello); Flaco Jimenez (accordion); Javier Zalba, Pantaleon Sanchez (alto saxohone); Antonio Jimenez, Carlos Oviedo (tenor saxophone); Ventura Gutierrez (baritone saxophone); Jon Hassell, Manuel «Guajiro» Mirabel (trumpet); Chucho Valdes, Roberto Fonseca (piano); Orlando «Cachaito» Lopez (bass); Joachim Cooder (drums); Amadito Valdes (timbales); Miguel «Anga» Diaz (bongos, congas, clave); Jim Keltner, Joachim Cooder (percussion); Pepe Maza, Alberto » Virgilio» Valdes, Juliette Commagere, Carla Commagere (background vocals); The Blind Boys Of Alabama. Posted on Μαρτίου 7, 2011, in CUBA, Ibrahim Ferrer, ΔΙΣΚΟΓΡΑΦΙΑ, ΚΟΥΒΑ, ΜΟΥΣΙΚΗ. Bookmark the permalink. 3 Σχόλια. ¨Οτι έχει σχέση με Κούβα είναι γοητευτικό !! Αλλά αν είναι γραμμένα στα ξένα είναι κομματάκι δύσκολο να τα διαβάσω ! !